As 2015 ends, the Eurocrisis has deescalated but it has by no means disappeared. The deal struck between Greece and its euro area partners in the early hours of 13 July was brutal, but it provided breathing space for political leaders on both sides. For Greek Prime Minister Alexis Tsipras, the head of a populist, anti-austerity but essentially pro-euro party, it brought an opportunity to stand up to EU partners but without severing external sources of financing. For Germany, Greece’s creditor in chief, it ensured that EU conditionality and the unwritten rules of EU diplomacy were enforced, but without breaking up the euro. Thus far – and the lesson of this year is that European political realities can shift suddenly – the deal has stuck. 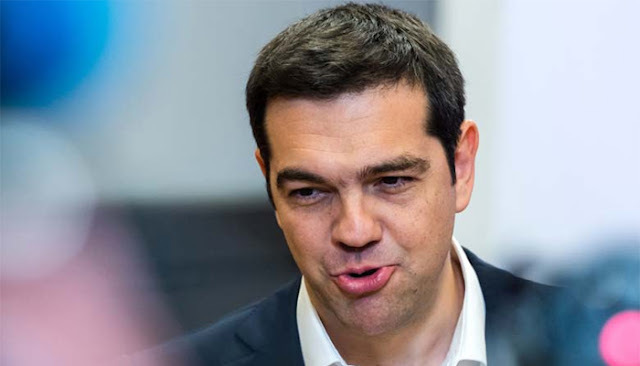 In August, Tsipras secured parliamentary approval for some of the reforms sought by EU partners under the terms of a new €85 billion-loan package before resigning. His re-election victory a month later came at the cost of a reduced parliamentary majority, but his party was also shorn of those members most willing to countenance Greek exit from the euro area. The favourable consequences for Tsipras were seen earlier this month when the Greek parliament passed a further round of budget cuts and tax increases without too much difficulty. Although the short-term political situation has stabilised, deep contradictions remain over Greece’s long-term position in the euro area. 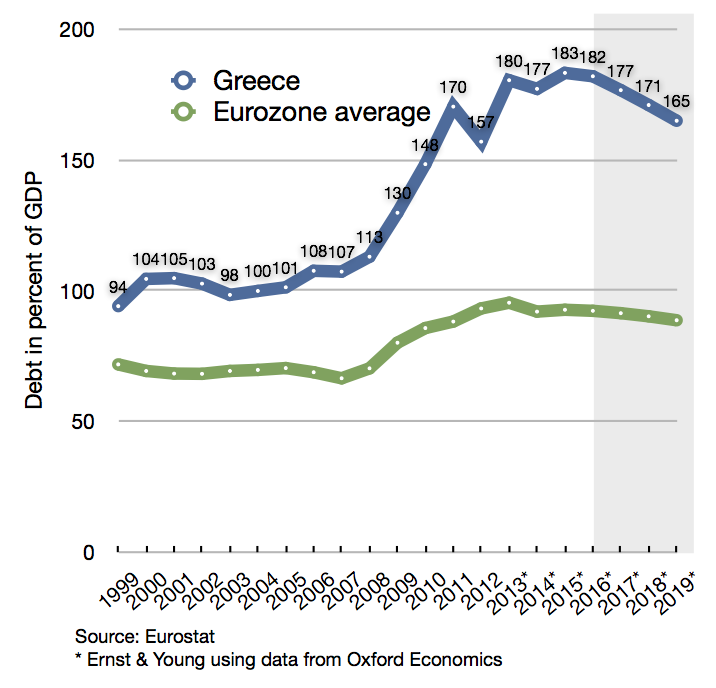 In 2016, Greece’s debt to GDP ratio is forecast to reach almost 200 per cent of GDP – double what it was at the beginning of the global financial crisis. As such, a further round of debt relief now seems unavoidable. This will be politically difficult since most of this debt is now in the hands of the official sector, which will be reluctant to take a loss on outstanding loans while extending further credit. The July 2015 deal left room for ‘additional measures…aim[ed] at ensuring that [Greece’s] gross financing needs remain at a sustainable level’. Such measures hinge on the successful completion of a review of Greece’s reform efforts, now expected to take place in February 2016. Even with further debt relief, Greece will struggle to solve its fiscal problems in the absence of growth and inflation and the outlook for both economic indicators is bleak. Having returned to growth in 2014, Greece’s political standoff with EU partners pushed it back into recession in 2015. Although the European Commission predicts a return to growth at some point next year, the economy is still forecast to contract by 1.3 per cent in 2016. Contrast this with the case of Ireland, where (too?) buoyant GDP growth pushed debt below 100 per cent of GDP in 2015 for the first time since the global financial crisis began. More worrying still for Greece is the outlook for inflation. Inflation would help to reduce the real value of Greek debt, but the country found itself facing a persistent fall in price levels in 2015 for the third consecutive year. Prices are forecast to rise in 2016 but not by much and the euro area as a whole faces continued concerns over deflation. This explains the European Central Bank’s recent decision to expand its efforts at quantitative easing but this move will suffice for neither the euro area nor Greece. In the absence of policy alternatives, the temptation remains for Greece to exit the euro so as to engineer a sudden surge in inflation, however costly such a move would be for the Greek economy in the long term. A possible way forward would be a targeted and time-limited programme of supply-side investment in Greece. The European Commission’s plan to invest up to €35 billion in Greece over the next five years is a step in this direction, although it remains to be seen whether such money recycles or adds to existing EU commitments. The European Bank for Reconstruction and Development’s investment programme for Greece, also launched earlier this year, is much smaller but it points towards a different source of international funding that could be scaled up.